Our 2018 Concert & Silent Eco-Auction is full of unique, eco-related art and experiences. The auction is a highlight each year and has steadily grown in popularity. Because we limit the number of auction item entries, and many of them are one-of-a-kind, bidding wars are common. We encourage you to bid early and bid often. This year’s Silent Eco-Auction will open at 5:30 p.m. and close promptly at 8:15 p.m. Winners will be posted when check-out begins at 8:30 p.m. Winners must pay with cash, credit car or check by 9:15 p.m.; after that time, the item will be offered to the second-highest bidder. Check out these five can’t miss items from this year’s silent eco-auction and read more about all of the items by visiting our Silent Eco-Auction Preview page. Do you love chocolate? We do! And so did many of our concert go-ers last year. 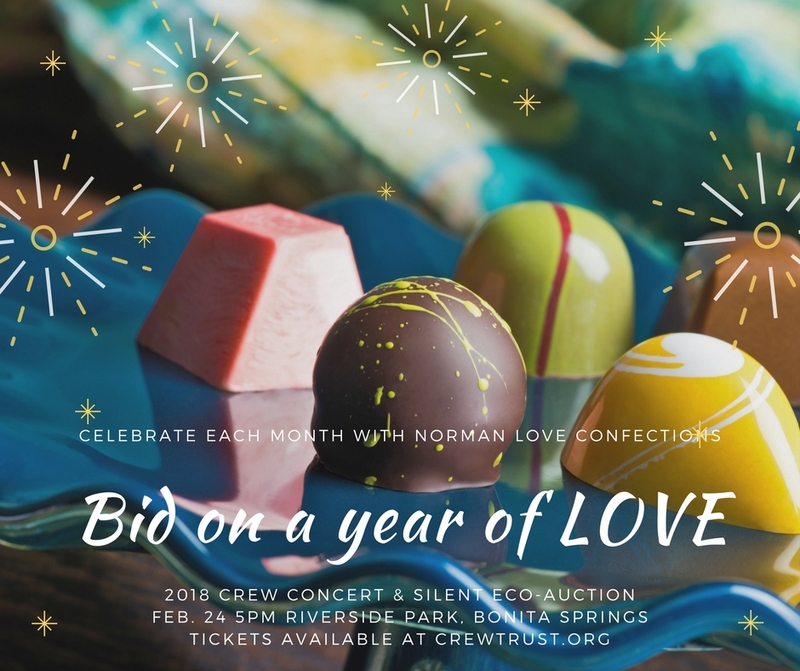 This very popular item, donated by Norman Love Confections, is back and we’re hoping it sparks another bidding war. The high bidder will receive a 15-piece box from the Norman Love Signature Collection, shipped directly to the winner or the recipient of your choice, each month for one year. Brian Hahn, owner of Momentum Brewhouse, has been a friend and member of the CREW Trust for several years. 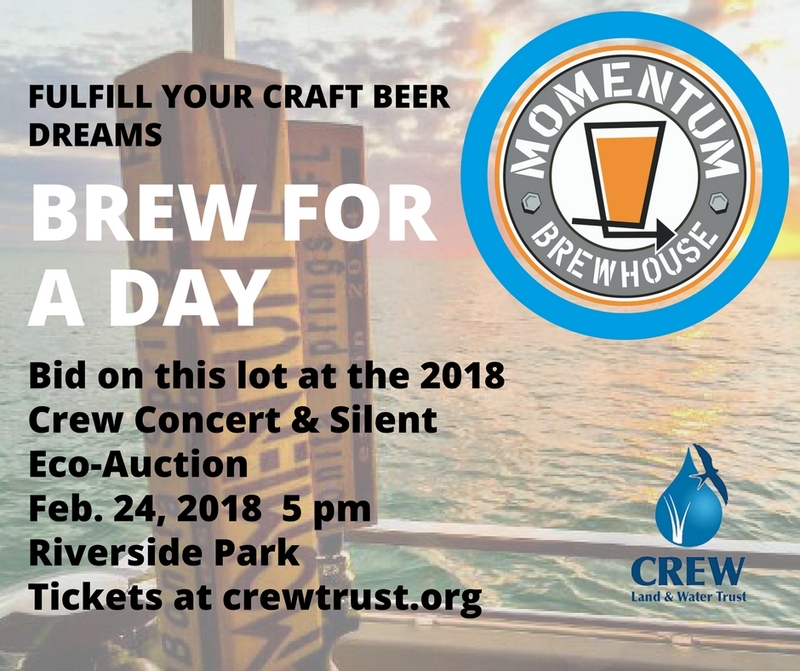 This year’s craft beer served at our concert will once again be from Momentum Brewhouse, and fans can bid on this lot for the chance to brew for a day! 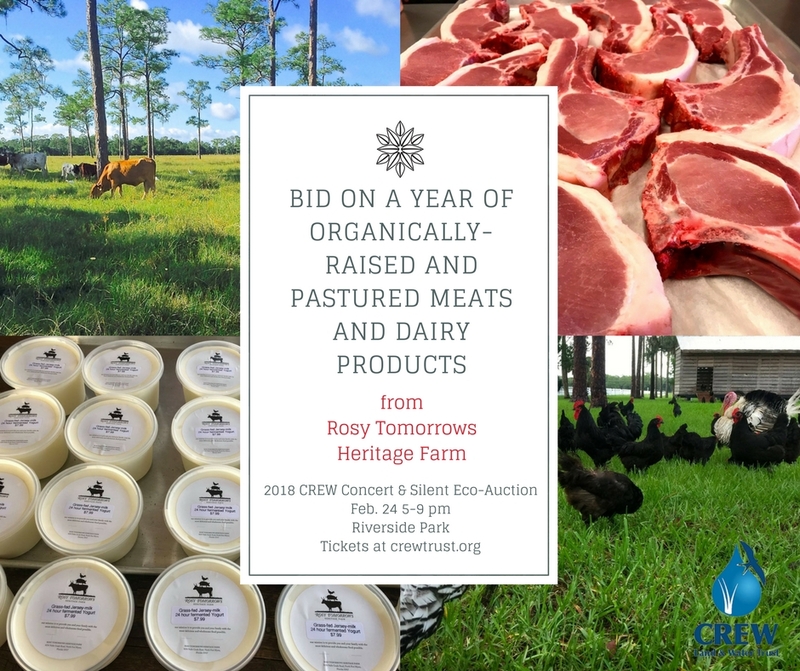 Our executive director loves the yogurt from Rosy Tomorrows Heritage Farm and we’re so excited to have this very unique and tasty experience as part of this year’s auction! Owners Rose O’Dell King and Gary King will choose selections each month from the bounty of the farm and the winner will also get to meet Rose and Gary and learn more about the farm. This experience starts in March and will tantalize your test buds through February 2019! Yes, we love CREW and where we work – but guess what we love even more? Artwork from our former FWC Biologist Molly DuVall! 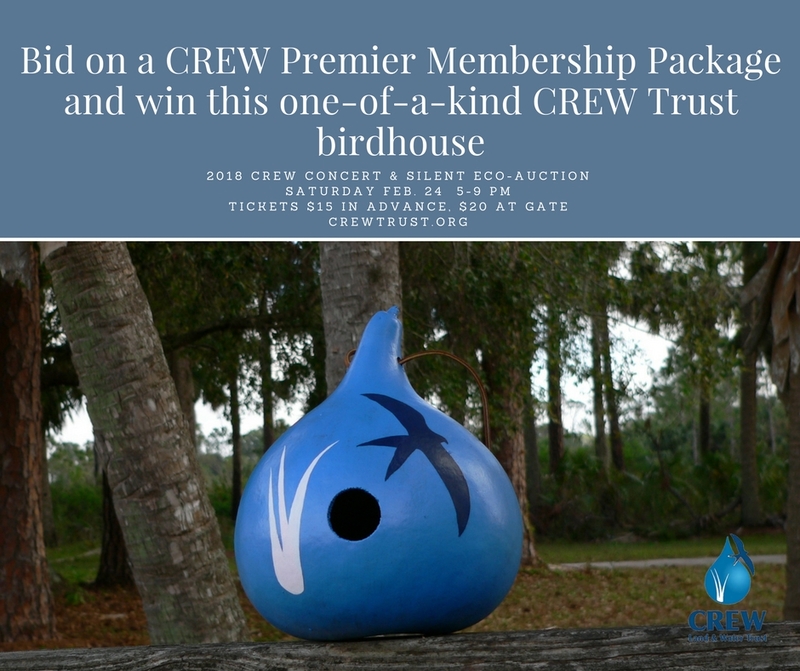 Molly painted this one-of-a-kind gourd birdhouse and the only way to win it is to bid on our Premier Membership Package! The package includes a Southern Bald Eagle level membership ($1000 value) , CREW Trust swag, invitations to our members-only events and a private guided hike at a CREW location of your choice for up to 8 people. AND Molly’s gourd birdhouse, painted with the CREW logo. We spend a LOT of time inland on our trails, and sometimes its nice to head to the coast and enjoy our gorgeous Gulf views! SW Florida Boat Tours will tailor this 2-3 hour tour to you and your guests. Their EGret 290 departs an hour before sunset, tours Naples Bay and Port Royal waters before making its way to the gulf for the Florida sunset. Your party can bring food, beverages and alcohol or arrange for a custom catered cruise. Date of cruise subject to agreement between winning bidder and Southwest Florida Boat Tours. Ready to bid? 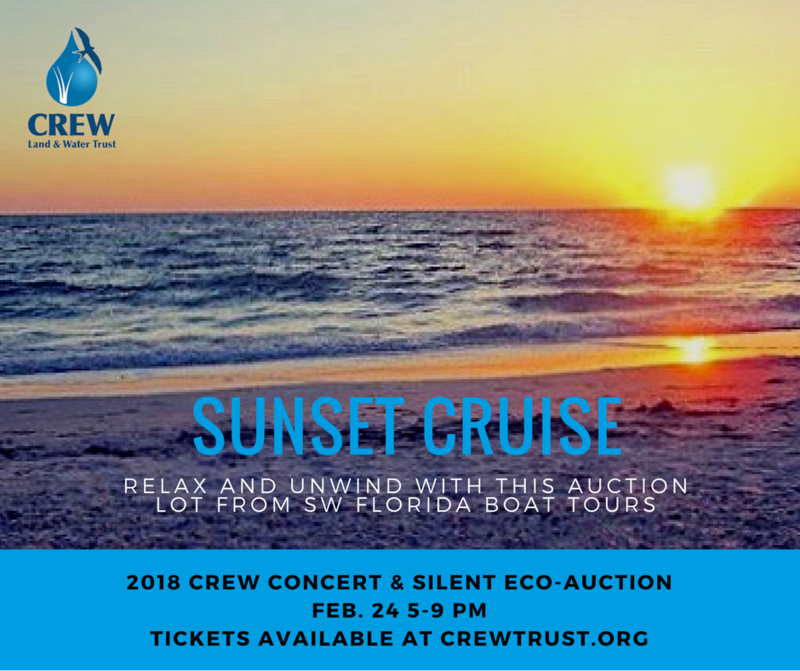 We’ll see you at the 2018 CREW Concert & Silent Eco-Auction on Feb. 24 from 5-9 p.m. at Riverside Park in Bonita Springs. Tickets are $15 in advance and $20 at the door; children 12 and under are free. To purchase tickets, visit eventbrite.com.